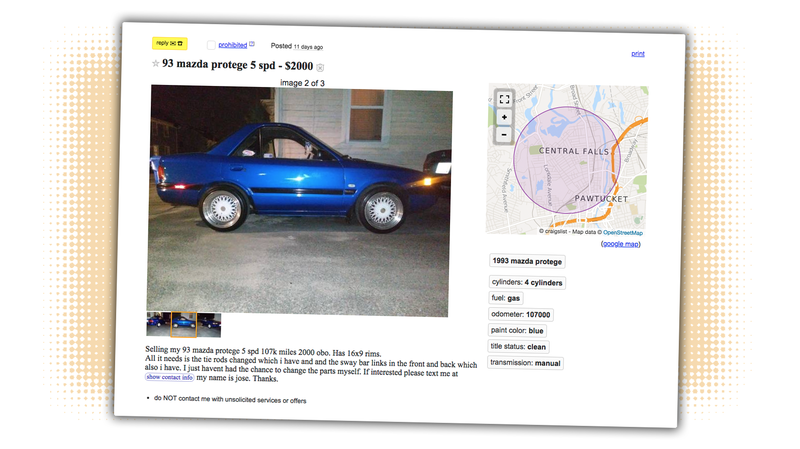 This is a Craigslist post from Rhode Island selling a 1993 Mazda Protege. That shouldn’t be a big deal. But this Protege, while it appears to be in quite good shape, is missing something. Specifically, it’s missing well over a foot and a half of Mazda Protege. And, what makes it even more incredible is that this fact is not addressed once in the ad. I’m very confused. Selling my 93 mazda protege 5 spd 107k miles 2000 obo. Has 16x9 rims. All it needs is the tie rods changed which i have and and the sway bar links in the front and back which also i have. I just havent had the chance to change the parts myself. If interested please text me atshow contact info my name is jose. Thanks. Really, Jose? You mention the rim size and that you changed the freaking tie rod ends and sway bar links but it slips your mind to explain that, for some completely incomprehensible reason, this Mazda has been shortened dramatically. I’ve seen old Volkswagen buses made into hilarious, cube-like shorties before, and old Beetles, and a few other cars, usually older imports with cult followings like original Minis. But an early ‘90s Mazda economy sedan? Who did this, and why? I mean, it’s not like I dislike it—I think it’s kind of amazing. Whoever did it did a great job. It appears to have been made from the four-door sedan, and the remaining doors seem to be cut-down rear doors. I think the car was sectioned from the A pillar to the B pillar, the whole front section removed, and the B pillar back moved forward. It’s a clean job! Here’s what I’m wondering: is it possible Jose doesn’t realize Mazda never built a 2/3-length Protege? Was he a second or third owner and just figures Mazda sold an incredibly short two-door sedan? He is in Rhode Island; maybe he thinks this is some special tiny model made for America’s tiniest state? I just can’t understand how, if you were aware that you were selling a car with about 55 percent of it surgically excised, you wouldn’t see fit to, you know, mention it. At least in passing.